I have always been grateful for my patriarchal blessing, the personalized blessing that LDS people can receive once in their lifetime from special servants of God called patriarchs. I received mine long before I was married, but it offered lot advice that would help me throughout marriage. One important part tells me to be "solicitous" of the needs and wants of my wife and to give her adequate time and attention. I think that is valuable advice for anyone, but given my weaknesses and pressures, I think it was extremely important to have that for me to ponder. There are times when I wish I would have heeded it better. Last Saturday I was feeling pressured with the need to get tax information ready and to prepare for some visitors coming in the afternoon. My wife told me that she was going into town to watch the Appleton Girls Choirs perform since some of the girls in her music classes would be singing. She said she knew I was busy and would go by herself. No pressure at all--it wasn't like one of our kids was singing and I really needed to go, and I had too much to do as it was. But the words of my patriarchal blessing rang in my head, and I just felt that I should go with her. As she started to leave, I surprised her by going along, giving up some tax prep time for an afternoon date. I could have worried about where I'd get the time to finish the taxes since we were expecting guests later in the afternoon, but I felt I could juggle things somehow. A challenge was that there might not be tickets that would let us sit together. She had a reserved ticket she was going to pick up, and while there had been an empty seat next to it earlier, it wasn't likely to still be available when we got to the box office at Lawrence University. In fact, there was a long line at the box office and it looked like we were going to be late to the concert hall (Lawrence Chapel in Appleton). Always the romantic, I had brought along a book just in case and if we couldn't sit together, I'd wait outside or stroll over to the library and read. But as we were standing there in line, out of the blue a woman approached us and asked if we'd like to but some of her five tickets that she couldn't use. She had two right next to each other and we snatched them at face value, told the box office that we wouldn't need the reserved ticket we had anymore, and rushed into the hall with plenty of time. Turns out they were probably the two best seats in the house for that performance. Beautiful view, and plenty of leg room for me. It was a stunningly beautiful concert and a fabulous date. The people I thought were coming for the afternoon couldn't make it after all, relieving the pressure and giving me the time that I needed after all. That evening when we had brief scripture study as a family, I told my wife and son that I was so grateful I was for that time with my wife, Kendra, at the concert. It was such a happy, beautiful time and turned out to be the highlight of my day, yet I came close to missing it in favor of cranking through receipts and depressing numbers. I said I'm so grateful that I paid attention to that counsel in my patriarchal blessing which helped me have one more day of "living joyfully with [my] wife" (Ecclesiastes 9:9). The counsel that is given by the Church does much to bring joy into marriage and family life, as does the eternal perspective that the Gospel brings to marriage. May all of us married folks learn to live joyfully with our spouse. If all you knew about the Lutheran faith were some of the unkind criticisms of Martin Luther from his opponents ("he condoned polygamy!" or "he wanted to subtract whole books of the Bible!") or mischaracterizations of the theology, you would fail to grasp the beauty and meaning that many Lutherans find in their religion. The same applies to Catholicism, where the apparent mistakes of various popes and some of the problems of the past are dead-end streets that do not take us into the hearts and minds of faithful Catholics. That's not to say that the criticisms are without merit, but they are often worthless if one wishes to understand what Protestants and Catholics actually believe and especially what they experience in their faith. This principle applies to the Latter-day Saints, of course. Based on the mischaracterizations of our opponents, some people think that being a Mormon requires complete abandonment of thought and mindless, unquestioning following of oppressive leaders. Some think that it has nothing to do with faith in Christ or worship or God, and is all about self-righteousness or perhaps just social programs. Those who focus on the attacks on Joseph Smith or the caricatures of our faith created by critics miss the most basic aspects of the faith. They miss that "Mormonism" is about creating a living, joyous faith in Christ that can transform our lives into a daily walk with God. I want to emphasize the word joy. The most basic thing about the "restored Gospel of Jesus Christ" as taught in The Church of Jesus Christ of Latter-day Saints is that it brings joy and meaning to the hearts and minds of its followers. There is spiritual peace and joy coupled with much more intellectual satisfaction and meaning than one would ever infer from hearing the rants of the anti-cult professionals. Yesterday in the once-a-month "fast and testimony meeting" that I attended, two teenage sisters, two newcomers to town, stood at the pulpit and shared their experience to a crowd of new friends. They told of the daily joy and peace they have been finding since their family began praying regularly and returning to activity in the Church. They explained how much better life is for them through the Gospel of Jesus Christ. This is what I have experienced, and what so many of those I know have experienced. My two years of sharing the Gospel in Switzerland and southern Germany greatly strengthened my personal witness of the power of the Gospel because it was like a laboratory setting in which I could see what the Church did for people. I could see the before and after states over and over again. The Gospel brought people joy, peace, and yes, even intellectual satisfaction as they could now resolve theological and philosophical puzzles, makes sense of this mortal journey, and understand who we are, where we came from, and why we are here. Biblical prophecies and patterns of history make more sense and the knowledge we gain gives us direction and purpose. The importance of families became more clear and through the Gospel, marriages were strengthened, family bonds were strengthened, and people had better, more wholesome lives. The teachings of the Gospel help people avoid addictions and many other dangers to body and spirit, and help people have healthier, happier, and more intelligent lives. Some don't - some have conflicts with fellow members or object to various teachings and practices, or find the demands on time in various callings to be too much and have negative experiences. But in my experience, the overwhelming majority of those who are willing to take the Gospel seriously and live it find rich blessings, joy, fulfillment, and purpose. Sincere, thoughtful Christians who learn and embrace the "restored Gospel of Jesus Christ" tend to find meaning and great joy in this route to following Jesus Christ and worshiping God--yes, the Jesus Christ and God the Father of the Bible--and if you don't understand this, you still don't know the first thing about Mormonism. But it's never too late to start learning. Last week I spend almost 3 days with over 40 high-school students as a chaperon on a trip to a musical competition in Chicago (the group included my youngest son). I came away really impressed with the richness that is being added to these students' lives through the beauty and power of music. This reminds me that the smartest thing I ever did was to marry my wife, among whose many fabulous attributes is a deep love for music that has resulted in all four of my sons being skilled musicians. She also knows how to encourage young people who don't always want to practice enough. I feel that the musical experiences and discipline they have all had form an important part of their lives and make them more well-rounded, fulfilled, and capable young people. On the other hand, there's me. My sweet mother tried. At age 8, she got me signed up for piano lessons. I took them off and on for about three years, typically not practicing enough. One day we had a recital at our church. I thought I did OK. But the next time I whined and said I didn't want to keep taking piano lessons, she said OK and that was it. It wasn't until a couple years ago that I learned that my "OK" performance was so horrific that she was mortified in front of her friends and happy to pull the plug. Ouch. My bad, of course, but today I feel regret for having been so dense and quitting. I shared this story with a musician friend recently who said, "I've never heard an adult say that they regretted being pushed by their mother to keep taking piano lessons." Any counterexamples out there? Music not only adds richness to one's personal life, it can be a powerful tool to serve and inspire others. The skills of an organist or pianist, for example, are in demand in so many parts of the Church. The ability to sing or teach others to sing is a wonderful gift that can bless children and adults in the Church and beyond. My observation of teenagers in the Appleton area is that the kids who are serious about music are generally well above average in terms of character and "classiness," in spite of all the problems they may have and all the temptations they fall into. There may be multiple reasons for this, not necessarily cause and effect, but I can't help but suspect that music and its rigors do something good for he individuals that is reflected in other aspects of their lives. The Flesh and Bones of a Resurrected Body: A Serious Teaching Moment or Just Divine Smoke and Mirrors in Luke 24? He stood before them. They could see Him. Wow! They thought it was His spirit. So then he had them feel His tangible body and stated that it was not just spirit, but also obviously comprised flesh and bones. They marveled. To further remove any doubt, He then asked a most surprising question: "Have ye any meat?" What, He wants to eat? Why was He doing this, if not to teach basic facts about Who He was now as a Resurrected Being with flesh and bone? They handed him some physical, tangible fish. He held that fish in His hands, put it up to His mouth, bit some off with His teeth, chewed it with His jaws and tongue and palate, then swallowed it, presumably sending the food down an alimentary canal. Or was this all just divine smoke and mirrors, with food particles being suspended by a tractor beam and then teleported a few miles outside of Jerusalem to create the majestic illusion of eating and swallowing food, a second act to the trick of creating the illusion of a tangible body? If this was all just a temporary "manifestation" of a body that wasn't really there and would soon be abandoned in favor of being immaterial spirit only, WHY was he doing this? Why not just say, "Yes, I'm a spirit. Don't bother touching me, just look and be glad that my spirit lived on." Was He showing us what our resurrection will be like with a temporary manifestation that doesn't really apply to Him? Why not explain that? Why leave His followers with the unmistakable impression that the Son of God looks like us (as if we were created in His image) and has a tangible body of flesh and bones capable of eating food? Maybe that even enjoys eating food? I can understand why philosophers steeped in Neoplatonic thought would find this laughable or shocking, but should we? Reality or smoke and mirrors? What was Christ doing in this powerful demonstration to his disciples, whom he now asked to be witnesses of what they had just experienced. Witnesses of what--reality or illusion? The Book of Mormon: "Our Story"
Recently I was in a discussion with the missionaries and a couple of friends, one a member of the Church and one not. One of the missionaries, in talking about the Book of Mormon, talked about the ancient journey of Lehi and his family out of their homeland to the Americas. "Their story is really our story," the missionary said. I was puzzled at first. "Why is this about 'our story'--what does he mean?" As I looked around, it hit me. In this room of five people, I was the only one born in the US. One woman came here from China and another emigrated from Taiwan. The missionary who had been speaking was born in the Marshall Islands and emigrated to California with his family, and the other missionary was raised in Mexico City and his family has now emigrated to the US. Everyone but me had he story of being born elsewhere but emigrating to the United States in search of something better. This is related to a theme in the Book of Mormon in which physical migrations to a "promised land" are treated as a symbol of our journey the Kingdom of God. These journeys include those of Nephi and Lehi to the America, the Mulekites to the Americas, the Jaredites to the Americas, the Nephites from the south to the land of Zarahemla, and Alma and his group oout of captivity back to Zarahemla. The story of deliverance from captivity or other problems by emigration to a promised land, with all the dangers and hardships that come along the way, is "our story" after all. Admiral Jim Stockdale is a man who understood the pain and trauma of physical torture. Admiral Stockdale was the highest ranking United States military officer in the “Hanoi Hilton” prisoner-of-war camp in the Vietnam War. During his eight years of confinement (1965 to 1973), he was tortured over 20 times. Some of the most destructive mistakes in our society come from crazed optimists. These dangerous optimists, in my view, are people who lack the imagination to adequately assess unseen but sometimes predictable danger, or who can't accept that dramatic and disastrous change can strike. Examples include couples who optimistically violate God's moral codes and face disease or unwanted pregnancy, the mangled cars and bodies from drivers who thought they could drive safely at crazy speeds, the addicts who thought they would try drugs just once, and the nation whose currency will be debauched and whose rising generation will inherit bankruptcy, poverty, or the captivity of crushing debt because of our inability to curb a delicious spending spree. The most dangerous optimists of all can't grasp the threat of genuine evil. They can't imagine that there are power-hungry maniacs who would do anything for their own benefit, and whose aims go beyond mere wealth to a devilish quest for power and control of other people's lives. So many people I talk to seem unable to grasp such threats--in spite of recent world history in which millions would die and millions would be impoverished because the various "agrarian reformers" or "representatives of the people" that they trusted turned out to be evil beyond anything they could imagine. What such men have done and how they did it needs to be studied. It was the study of the abuses of power and an awareness of the many unseen but often predictable threats to liberty that drove our Founding Fathers to give us a government that was deliberately crippled to keep it small and forever checked and limited to block the evil ambitions of some mortal men and leave God-given liberty and personal responsibility for our lives in our own hands. One highly respected local LDS leader I spoke with many years ago expressed dismay when I discussed some troubling political matters that smacked of treason and betrayal of our freedoms by elected officials. He said that we should trust our leaders and preferred to assume that they are always acting in good faith. He quoted a famous LDS businessman who once said something like, "Don't tell me what's wrong with America. I want to hear what's right with America.!" That feels nice, but don't rely on that thinking when it comes to preserving your freedom, or your health: "Doc, don't tell me what's wrong with my body. I only want to hear what's right with my body!" I'm reading a terrific book from an atheist and socialist who has some very wise insights into the decay of modern religion and the foolish optimism of modern society. I won't agree with her on some fundamental points, of course, but I love her writing and wit and really enjoy this book. The book is Barbara Ehrenreich's Bright-sided: How the Relentless Promotion of Positive Thinking Has Undermined America. She warns against the dangerous lack of imagination we face under the deadening influence of positive thinking, leading people to spend foolishly and go hopelessly in debt, leading banks to create ridiculously insecure derivatives and other schemes that could only work under optimistic conditions (or with sufficient government bailouts), leading businesses to afflict their people with empty motivational speakers and mystical New Age retreats, leading some Christian churches to replace the God of the Bible with a magical personal assistant whose purpose is to help you get rich, and leading a whole irrationally exuberant nation to create and be punished by bubbles and Madoff-like schemes. The Book of Mormon, in my opinion, does much to cure us of the foolish optimism that afflicts this nation and keeps people trapped in behaviors and mindsets that will make them victims to their own passions and make them gullible targets to be exploited, impoverished, and even made captive by others. The Book of Mormon warns us that destruction can come to entire cities or nations. The Book of Mormon warns us to prepare carefully for times of famine, war, and trouble. The Book of Mormon warns us of the constant dangers to liberty that we must watch for. It warns us that government is a lure for the worst, most dangerous criminals of all time, men who must not be trusted when they seek to grab more power, and warns that there must be restrains on the power and trust we can give to any one man. The Book of Mormon warns us that there are men like Amalickiah and entire groups of elite, well-connected people like the Kingmen of Captain Moroni's day who will gladly tear down the liberty of a free people to gain power and glory and to transfer vast power to prospective tyrants. Most pessimistically of all, and most difficult of all to accept or even to discuss seriously when one is drenched in the delusion of mortal optimism, is a concept that the Book of Mormon teaches and emphasizes repeatedly, a topic that we rarely hear in Sunday School or church meetings of any kind, so troubling and worrisome is this loathed mass of pessimism coming from this sacred book written for our time, compiled and edited by those great and final Pessimists, Mormon and Moroni, who watched their nation self-destruct and who prophetically saw our time and knew what could befall us as well if failed to heed their warnings. That concept is one that the Book of Mormon warns will pervade our time and threaten our liberty and the liberty of the planet ("all nations"). I refer to the loathsome topic of "secret combinations"--networks of conspiring men, often rich and influential, including those of noble birth, merchants, lawyers, judges, and politicians, as well as gangs of criminals and guerrilla warriors. Operating in secret to gain power and influence, they work from within but also are willing to work with and exploit the enemy and do whatever it takes to gain power. Lives and liberty itself will be sacrificed for their quest for power. Many Latter-day Saints seem to assume that all these dire warnings are about the pathetic and weak Mafia, which does not seem to have done very well in terms of overthrowing the liberty of any nations recently, though Sicily and a few US cities have their share of trouble, to be sure. I think we need to be willing to begin to draw upon the power and wisdom that comes from the Book of Mormon's informed pessimism about the dangers of mortal life, while also having the long-range optimism that recognizes we will ultimately prevail through the Atonement of Christ. But until that glorious day of deliverance comes, we are here in mortality where we must face the most brutal facts of our current reality. We must understand where this nation has been headed for several decades now, what the threats to liberty are, why endless deficit spending gives power to some while impoverishing the many, and what on earth the Book of Mormon is trying to tell us. Secret combinations, whatever they are, have the disadvantage of being secret, at least when they are most active and successful. But their goals can surely be understood from Book of Mormon teachings, and those ends can be resisted by, for example, keeping the inspired check and balances of the US Constitution in force and keeping the powers of government small and constantly constrained. (And if someone comes out and says that they are part of what appears to be a secret combination or supports one, perhaps we should not trust them with too much power.) We owe our liberty to Founding Fathers who were pessimists when it came to trusting humans with power. I feel that it is time we begin to take this volume of scripture more seriously, and not flee in fear or close or minds when it does not resonate with the mindless optimism that can be so comforting. "When we were set apart for this calling, Elder [Richard G.] Scott of the [Council] of the Twelve Apostles taught us many important lessons. He spoke from personal experience when he was a mission president in Argentina. One message that he shared with us is this: 'At times, during your mission, you will be awakened in the middle of the night or the early morning hours with thoughts of specific things you should do for certain missionaries. Do not ignore these thoughts. They are promptings from the Holy Ghost who will communicate with you in the stillness of the night or the peace of the early morning hours. He will speak to you then because that is when you are still enough to hear.' Elder Scott further instructed us to keep a notebook beside our bed so that we could record these precious promptings. He said that by the next morning, we would be likely to forget the promptings if we didn't write them down. "We have been astonished at the fulfillment of Elder Scott's prophetic words. We have received many promptings in the exact manner that Elder Scott described. We are so thankful that Elder Scott taught us how to recognize and act upon these precious promptings. Had he not taught us, we may not have given these promptings the attention they require. "Nearly two and one half weeks [before the earthquake], I was awakened at around 4 a.m. by just such a prompting. I did not hear a voice, but the thought was as clear as if it had been in the form of spoken words: 'There is going to be an earthquake. Prepare your missionaries.' I sat up in bed and immediately remembered Elder Scott's counsel. That morning I told Larry what had happened. He immediately set to work organizing our missionaries to prepare for an earthquake. "In talking with our office missionaries to arrange for them to put together a list of everything we would need to prepare...in both Spanish and English...we discovered that the Lord had also let two of our office missionaries know of the possibility of an earthquake (in the form of dreams) and the need to prepare our mission. We set a goal and arranged our schedule so that we could visit every apartment in the mission to check for safety and to review with our missionaries what to do in case of an earthquake. What a wonderful experience we have had as we have met with them and shared scriptures with them about being spiritually and physically prepared. '...if ye are prepared, ye shall not fear' (D&C 38:30). We instructed every missionary to have a "go-bag" (36 hour kit). We reviewed our emergency action plan with them of where to go and what to do if they had phone service and in case they did not. We gave everyone a paper with all instructions in English and Spanish, and we reminded them that 'this life is the time to prepare to meet God' (Alma 34:32-34). We shared with them our thoughts and feelings about the need for spiritual and physical safety. Some of them became frightened and asked us if we knew something they didn't know. We smiled and repeated '...if ye are prepared, ye shall not fear.' We didn't want to unduly alarm them, but we did want to impress upon them the need to be prepared. We tearfully reminded them of our recent transfer conference where we had shared our feelings about our dear Elder McKay Burrows who was unexpectedly called home in January while serving his mission in Romania...how he was prepared in every way to meet God. We reissued our challenge to 'be prepared' in every way. Then we knelt with them in their apartment and dedicated each apartment, asking for a blessing of safety and security to be upon every apartment. "When the earthquake came, we were prepared. We did not experience the panic that many felt. We knew we were prepared. Because of the words of the Lord's chosen apostle, Elder Scott, we had listened and heeded the quiet, but clear promptings of the Holy Ghost. We were blessed with peace in the midst of chaos. We learned an important lesson: our preparation helped us to avoid panic and fear, but the Lord, in His wisdom, allowed us to experience enough discomfort to know that He has all power. He is in charge. We are nothing without Him. We are dependent upon Him for every breath we take. Only He can save us from death and destruction. He is the way, the truth, and the life. He is our perfect example. If we follow Him, we will be saved through obedience to the laws and ordinances of His Gospel. "As the earthquake became more violent, the mission home groaned and wailed. The power died, so the whole city was black. The windows made a hideous screeching sound, and flying objects banged against swaying walls. The printer/fax machine, books, book ends, and fifty-pound television burst from the entertainment center and crashed to the floor, cabinets emptied, drawers flew open, the refrigerator moved, water sloshed out of the toilets, the floor jolted up and down as we ran across it trying to hold onto the walls to keep from falling down, and the piano toppled over like a small toy. As we made our way to the back yard, I remember thinking, 'God is all-powerful. He is our only refuge from this horrible mess.' I prayed and prayed for Him to still the earth. When we reached the back yard, we watched in terror. By the light of the moon we could see the swimming pool water form giant waves and crash out onto the rocks. House and car alarms screamed into the night...some from being crushed by falling debris and others I guess from the bizarre movement of the earth. I am not sure if the intense rumbling sounds came from the earth itself or from everything else that was shaking so violently. Finally, it stopped. When the calm came, we had to sit down because our legs were weak and unstable. My legs stayed wobbly all day and night yesterday. Today (Feb. 28) the muscles in my legs hurt like I ran a marathon. The aftershocks have been extremely unsettling. Each one begins like the one last night started. We just close our eyes and wait to see if it escalates or dies down. I have never experienced anything like this! I think it's noteworthy that the inspiration to prepare for the earthquake came to the President's wife. I am grateful that he listened and acted on the promptings she received! This may have made a significant difference that allowed the missionaries in Chile to be much more effective in helping those around them in dealing with this disaster. The scope of the disaster in Chile was far less than in Haiti, for Chile has long prepared for earthquakes with building codes often superior to those in the US, yet this was so powerful. Hundreds were killed, with tragedy striking believers and non-believers, old and young, rich and poor. I am grateful that the missionary force there was able to be part of the solution as they jumped into gear serving and helping in afflicted regions. Humbly listening to spouses and others can be one of several ways to gain inspiration that can make a difference in our callings and lives. Time for "Mo-Sure" Food Markings? Everyone knows about kosher food and many food companies show respect for the dietary constraints of Judaism by putting kosher food symbols like a circle with a U or K inside on their kosher products. 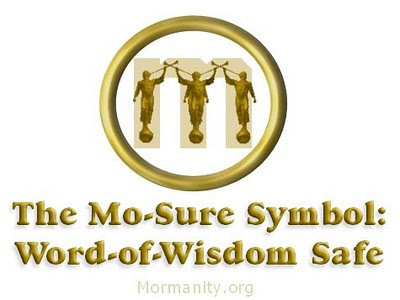 Since the world population of Jews is about the same as the world population of Latter-day Saints, maybe someday we'll get my proposed LDS equivalent of kosher markings: "Mo-sure" markings (as in Mormons can be sure it's OK). I thought of this last night while enjoying dinner at our local Fratello's restaurant on the Fox River in Appleton. My wife ordered butternut squash ravioli which included an apricot-brandy sauce. I recognize that the tiny amount of alcohol used in cooking such sauces is essentially cooked out (the apricot-brandy mix just had a trace of alcohol added, the waiter told me when I asked). Probably nothing to worry about, but I still have an adverse "TBM reaction" to alcohol being used in preparing my food. So I zealously scanned the menu for items free of alcohol. Ah, the gnocchi! The description was perfectly Word-of-Wisdom safe. It was even better than I expected, with a marvelous rich, fresh, tomato-based sauce that reminded me of what I had from Italian families while on my mission, the kind of sauce that takes hours to make. When the manager came by to check on our meal, I commented on how good the sauce was. "Oh, yes," he said. "It's very good. We start with our marinara sauce and add a few things to it, then cook it down a bit - that gets rid of most of the vodka." My wife tried not to laugh as I politely nodded in approval. If only the menu had been marked to show which items were truly Mo-Sure. Here's my suggestion for those of you who want to be on the cutting edge of food labeling to keep the growing Mormon minority happy. It's a stylized M inside a circle. Other suggestions? If I don't see this all over packaged food and restaurant menus next time I come to a heavily LDS area like Utah, California, or Chile, I'll be sorely disappointed. You don't want LDS customers worrying that someone has been adding unwanted vodka to their gnocchi now, do you? In the video of LDS Apostle L. Tom Perry's comments for Special Witnesses of Christ, I am deeply touched by his story of working with other soldiers in post-war Japan to help rebuild Christian churches for the survivors in Nagasaki. They did this in their free time while other soldiers were partying. As these Christian soldiers were about to leave the area, they were mocked by their fellow soldiers for missing out on all the fun. Then something quiet but dramatic occurred that I think stands as a powerful metaphor for the joy that will be experienced by those who served God and their fellow men on this earth, who then begin their journey on that train that takes us beyond mortality. Here is the text of Elder L. Tom Perry's comments, one of twelve statements from the Apostles in the 2001 video, Special Witnesses for Christ. I was among the first wave of Marines to go ashore in Japan after the signing of the peace treaty following World War II. Entering the devastated city of Nagasaki was one of the saddest experiences of my life. A large part of the city had been totally destroyed. Some of the dead had not yet been buried. As occupation troops, we set up headquarters and went to work. The situation was very bleak, and a few of us wanted to give more. We went to our division chaplain and requested permission to help rebuild the Christian churches. Because of government restrictions during the war, these churches had almost ceased to function. Their few buildings were badly damaged. A group of us volunteered to repair and replaster these chapels during our off-duty time so they would be available for the holding of Christian services again. We had no command of the language. All we could accomplish was the physical labor of repairing the buildings. We found the ministers who had been unable to serve during the war years and encouraged them to return to their pulpits. We had a tremendous experience with these people as they again experienced the freedom to practice their Christian beliefs. An event occurred as we were leaving Nagasaki to return home that I will always remember. As we were boarding the train that would take us to our ships to return home, we were teased by a lot of the other Marines. They had their girlfriends with them saying good-bye to them. They laughed at us and indicated that we had missed the fun of being in Japan. We had just wasted our time laboring and plastering walls. Just as they were at the height of their teasing, up over a little rise near the train station came about 200 of these great Japanese Christians from the churches we had repaired, singing “Onward, Christian Soldiers.” They came down and showered us with gifts. 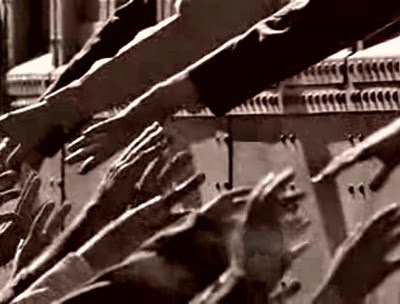 Then they all lined up along the railroad track, and as the train started down the tracks, we reached out and just touched their fingers as we left. We couldn’t speak; our emotions were too strong. But we were grateful that we could help in some small way in reestablishing Christianity in a nation after the war. I know that God lives. I know that we are all His children and that He loves us. I know that He sent His Son to the world to be an atoning sacrifice for all mankind, and those who embrace His gospel and follow Him will enjoy eternal life, the greatest of all gifts of God. I know that He directed the Restoration of the gospel again here upon the earth through the ministry of the Prophet Joseph Smith. I know that the only lasting joy and happiness we will ever find during our mortal experience will come by following the Savior, obeying His law, and keeping His commandments. He lives. This is my witness to you in His holy name, even Jesus Christ, amen. Here is an image from the video (rendered in sepia tones) to remind me of the parting of the Christian soldiers just moments after being mocked for wasting their time in selfless service.